Poker has evolved tremendously thanks to technology that makes it possible for us to turn on our computer or mobile device and instantly play the game with vivid graphics and even with live dealers when you opt to play live online poker. What was once a game played among other poker players around a table, poker, in all its forms - Texas Hold'em, Stud, Omaha Hi, Omaha Hi-Lo - can now be played alone and even without betting actual money, making today's poker environment an ideal training ground for aspiring pros. 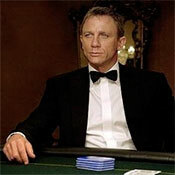 Changes in the poker arena are also evident in the 2006 James Bond film, Casino Royale, where a scene featured Bond’s admirable skills at playing No Limit Texas Hold'em. If you have read Ian Fleming’s 1956 novel, you will be able to quickly spot the difference in this casino scene. In the novel, Bond was playing high stakes Chemin de Fer, the original version of the card game baccarat when it was introduced to France, and not poker. Asked why the change in game, producer Michael Wilson explained that, "Today the big stakes game is Texas Hold'em. It's not unreasonable for ten, twenty million dollar pots to be seen. So, when we came to think about what the game would be, Chemin de Fer didn't seem appropriate but Texas Hold'em was." Aside from this, the fact that Texas Hold'em is the world’s most popular poker variant makes it the best option to play in the 007 movies. Texas Hold’em is the featured attraction of the Main Event of the WSOP and remains the kingpin of all poker tournaments. James Bond in one of the scenes in Casino Royale. The first thing that an aspiring pro needs to learn in poker is how to overbet for value. Generally, an overbet in poker refers to a postflop bet that either matches the size of the pot or is higher, although this term is also used to refer to any bet that is more than the usual bet, depending on the circumstances. The flop consists of the first three of five community cards. When you say post-flop, this is the time when players have the option to check (meaning to bet nothing), bet, call, fold or raise. This will depend on the players’ position at the poker table and prior actions they have taken. In poker, overbetting for value is ideal for situations where the opponent is deemed to have a strong hand, but not as strong as the player’s. If a player had a hunch that their opponent had a set of kings, for instance, after one has rivered their flush, overbetting would be a good move as a strong hand is usually difficult to fold. Going for value is perhaps the most common reason why poker players overbet. Making the big overbet is a great strategy to maximize the value of a player’s big hands, although doing so might also prevent the other players from calling, which could reduce the size of the pot. The postflop action will be able to give the player an idea of the strength of their opponent's hand. If the opponent is observed to be checking it down and betting very little pre-river, then it is safe to assume that they probably do not have something strong enough to call an overbet. However, if the opponent is betting all the way, overbetting might be ideal, especially with the bigger pot. The best strategy is to overbet with a range balanced with bluffs and strong hands. This enables the player to manipulate the opponent into choosing between two perilous actions, which is either to call down with marginal holdings or fold and enable the player to bluff them. When a player decides to check, they are deferring their betting rights for the time being so another player may now bet, after which the player may fold their hand, call the bet, or raise. The action of checking first and then raising after an opponent has made their bet is called a check-raise. A call is the act of matching the bet amount in order for the player to see the next card or, if the last card dealt was the river card, to see the showdown. The term “check-raise” in poker is a common poker strategy wherein a player checks early in a betting round, hoping their opponent will open. On the other hand, a “check-call” is a call made by a player who checked previously in the same betting round. In Casino Royale, Bond masterfully lured his opponents with his bluffs so they did exactly what he wanted them to do. At the Ocean Club scene, Bond had the best possible hand but he chose to give Dimitrios a false sense of confidence. Bond consistently had a strong hand when he flipped a nine, three, and ace, when the seven was turned over, and even when the final King was revealed. He was aware that no other possible combination could beat his tri-aces but Bond still checked every single time. Dimitrios felt confident that he held a very strong hand and went all in. While seasoned poker players have not recommended this highly risky strategy, Bond’s ability to conceal his strong hand undoubtedly paid off, with his opponent leaping at the chance to go all in. Donk-leading, also known as donk-betting, used to be one of the greatest sins in poker back when Limit Hold’em used to be very popular. Donk-leading on the flop refers to the act of giving up one’s chance to effectively act last on the flop. But now that so much has changed in the world of poker, donk-leads have become a common strategy for high-level No-Limit poker players who know exactly when, why, and how to build effective donking ranges in order to maximize their expected value. However, while a donk-lead would usually indicate a pretty strong range for tighter players or regulars, most recreational players are drawn to make small donk-bets and the best way to deal with a minimum-sized lead is to treat it as a check. As mentioned earlier, when a player decides to check, they are yielding their betting rights for the meantime, so their opponent may take their turn to bet. Watch as James Bond wins the tournament over LeChiffre. As recent years have shown us, poker has definitely evolved to become a tougher game to play. The final game in Casino Royale is the perfect example of how dynamic the game of Texas Hold'em poker can be. In this game, Bond had the weakest hand in the beginning of the game but ended up winning the whole tournament. Amateur poker players can become adept at playing the game by keeping these three tips in mind. There are also various online poker classes that teach the basics of poker, the various strategies, and the math behind this game. Yes, becoming successful in poker is possible!